Born in Bururi, Burundi, Mr. Pasikari fled for his life as a child to Congo when his home was overrun with the horrors of Civil War. 25 years later as an adult he was forced to become a refuge once again in Tanzania when Congo became engulfed in its own Civil War. Mr. Pasikari’s two daughters, skillfully translate the words of their father as he recounts his story of tragedy, survival and new hope. Let me ask you the five questions that we ask each of the people in our interviews and I would have to say, you all are people who definitely hope. I’d have to say that, you really are. So, Esiteri is their daughter and she is translating for us today. Thank you Esiteri, very much. Question 1: What is your definition of hope or your favorite saying of hope or quote about hope? How would you describe the word “hope” in your language? My definition of hope is that, for me, I grew up difficult, but since I have become a Christian, I understood how to have hope and to live with hope because I really try to follow and share the good example about the good news of the bible. Then, how Jesus Christ is related to giving humans or people hope on living true life. Great. Thank you. Great answer. Question 2: Who has shared the most hope with you in your life? Who in your past has given you the most hope? First is believing. You have to believe in God and also in Jesus Christ that it’s not enough to just believe in God and in Jesus Christ, but also from the people who are around you based on who they really are and what they teach you or what they share with you when you are going through life. Also the people who are around me, for example teachers, pastors from church, those people help me to have hope and family and friends. Also, what the bible tells me about hope and what it is to know Jesus and how the bible gives quotes about how people should live life and how they should have hope and live life the right way. Excellent. Thank you. Each of you can answer this separately because your stories are different. Question 3: When was a time in your life when you’ve really needed hope and had to use hope to get through a very difficult time in life? In my difficult time during my life, the most I had to do was to hope in God that everything was going to be all right by praying and having hope that tomorrow will be a better day for me. When I pray to God, I also have to have faith that God will be able to change things around even though when you are having difficult times during life based on where you live. We had a civil war twice, but since we had hope in God and we had faith, the only thing we could do was to pray and to have faith in God that everything was going to be all right and everything was going to be changed by having hope in God. Your hope is in God and Jesus. Did you always have your hope in God and in Jesus? Were you raised in a Christian family or is it a decision you made later in life? I grew up in a Christian family, so I had learned how to have faith in God by praying and believing that he will also be able to help me through difficult times and through life matters. Okay. Thank you. Many people who are listening to the interview or seeing the research that we’re doing through I Share Hope have never experienced civil war and you’ve mentioned that a few times as the hard parts of life. Can you describe for a minute what civil war like where you came from? You’ve been through two civil wars. Can you help us understand what a civil war is like? The civil war is a horrible, horrible story. People were killed during that time. Most people lose their families, their money and also their country because they had to move from their home country to somewhere new that they did not even know about. A civil war is not just a name, but something that takes your hope away, puts you in a difficult situation. The civil war made me move from my original country, Burundi, to Congo and when I was living in Republic Democratic of Congo, I lived there for years but we had bad luck and had another civil war which made me and my whole family move again. I really don’t like the word civil war or war around any place because that kind of situation made me lose a lot of things and up to this point that I have moved place to place trying to find life, but it’s so hard to keep moving and trying to adapt to new things. I did not like the idea of leaving my home. Civil war means losing the one you love or enemies killing your family members or your neighbors. Even though you’re not part of the military or didn’t do anything wrong, they’re just killing whoever they can? When we had to move from Burundi to Republic Democratic of Congo, we thought we were going to a safe place. We had to leave there because we didn’t have a choice to go anywhere else. We had to stay in Congo, but later on we heard that Burundi had united and there was peace, so some Burundians moved back from Congo to Burundi, but since the civil war there never had been peace around the citizens of Burundi. That’s the situation with the citizens in Burundi. Even now it’s still traumatic and it’s still a hard time there? Yes. I’m hearing that they’re going to have another war there because the governor…Whatever is happening, I’m not there I’m just hearing news that some people are getting killed even now. That’s the reason why most people keep on running from place to place. We really hope to go back to Burundi, but just hoping by believing in God and praying. Mr. Pasikari, thank you for sharing that. I know it’s hard. Thank you. You are a man I respect for your opinion because you know what it’s like to live in a place that’s not very hopeful and you know how to have hope. To be a refugee is not an easy thing because you go through difficult times. The most important part is to just believe that there is one God who created the whole world and he will always be there to give us hope and he will go with you through any situation that you would be going through. Only God gives hope to his people. I really appreciate you being here and asking us about our story and how we have been living our lives in the past. We are thankful and God bless you. Question 4: What is the way that you’re sharing hope today? How are you sharing hope with other people around you today? Hope without actions is nothing. My actions show that I have hope. What actions do you think shows hope? What actions do you take on a daily basis that show hope? By the way I walk, the way I talk and the way I love people. The way I treat people is a way of showing them that I believe and have hope. That’s great. The way you talk and walk and love people. Being part of that community again, wow. Question 5: How do you recommend that I start growing in hope – or anybody listening, how do I start becoming a person of hope like you? Start by being happy. Feeling good about yourself. Feel good about yourself, don’t let anything stop you from doing anything. Believe in yourself. Start by being happy, don’t let anything stop you from doing something, believe in yourself. I like that. That’s a great answer. 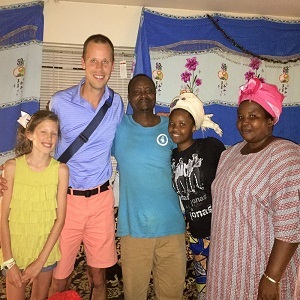 Thank you so much for coming through three African countries and then to America with your family and being willing to share your story of hope with us. Thank you for coming, for the talk and the story. How you talked about hope was a good talk and for being a Christian. We are Christians and we are strong Christians, so we like some people to think about it – becoming a Christian. I would love for anybody who’s listening to know that hope and faith work together. Great faith can give you great things and show you big things. Being a Christian is the very best thing anybody could have even though people don’t see that. For us, it’s a very big deal and that’s why we are here today. After all those stories, we are still rejoicing and happy because we have Jesus. You can see that if you are here with me now. I’m sitting in the den or the living room of the home and they’re beautiful people and a beautiful family and you can see that their focus here is not on the hardship of two civil wars, changing three countries and changing continents after that. Their story and their focus is on moving forward and raising wonderful children and being part of a new life and faith and Jesus and what the bible teaches is an enormous part of that story. Wonderful. AND, we got some Fanta Pineapple Soda, which is great. Okay so, just to be fair here, the second half of this interview was translated by – tell me your name one more time. Nadine. How old are you Nadine? Always remember that a good friend comes from God. That’s a great quote to leave with. A good friend comes from God. Thank you very much Pasikari family. You all are excellent. Wonderful interview. What’s your favorite song? Any song. I don’t care if it’s English or not. Just any song. [Sings] It’s like Jesus, I remember the day I accept you in my heart. I remember that you are my God and I will always rejoice.